What Is The Best Horse Halter On The Market? Whatever else your horse has in his wardrobe, you’re going to need a decent halter. Catching your horse and leading him in from the field is so much easier with a halter than with a (bitless) bridle; it’s so much easier to put on and there is generally only one strap or buckle to do up – great if you have one which is a bit headshy, or one who doesn’t like to be caught full stop! Chances are you have a huge pile of old halters lying about that will “do” but you would be forgiven for wanting a new, shiny one that is fitted right to your horse and generally makes the job easier. 2.1 1. What are the purposes of a horse halter? 2.2 2. Is a leather halter best? 2.3 3. How do you take care of a leather halter? 2.4 4. What types of leather halters are available? 2.5 5. Are there different kinds of halters for different kinds of horses? 2.6 6. How important is sizing? 2.7 7. How do you determine the right size halter for your horse? 2.8 8. How can you find the right halter for your horse? 2.9 9. What is a grooming halter? 2.10 10. What are the benefits of nylon halters? 2.11 11. How do you clean a nylon halter? 2.12 12. Should you have both a nylon halter and a leather halter? 2.13 13. Are there any downsides to nylon halters? 2.14 14. Are nylon halters safe? 2.15 15. What is a breakaway halter? 2.16 16. Why are rope halters so popular? 2.17 17. How can rope halters be helpful? 2.18 18. Can a rope halter hurt a horse? 2.19 19. How do rope halters compare with other types of halters? 2.20 20. Can rope halters be used for turnout or tying out your horse? 2.21 21. Do rope halters come in different sizes? This is a beautiful, luxury leather halter made of the finest materials and designed with your horse’s comfort, and functionality, in mind. Snap at throat – This is one of those “throw it on over the head” halters, which gives you instant control of your horse and is ideal if you have one that likes to wander off before you’ve got the straps fastened! Soft leather for comfort – Making sure the halter doesn’t rub around your horse’s ears and nose is highly important, as these are sensitive areas which will make him grumpy if they hurt. Comes in great colours – Having a headcollar that stands out is a good thing, both for your horse and for you, when you’re trying to find it in the dark! 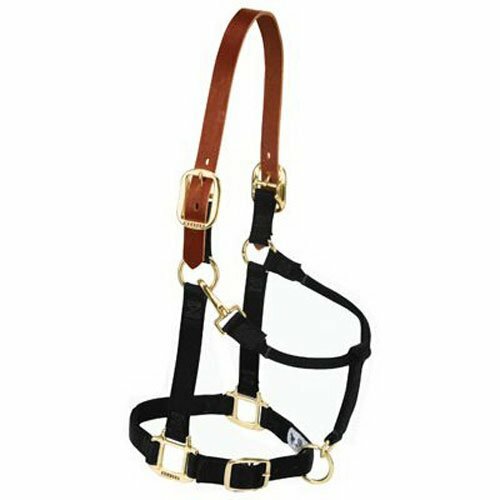 Fantastically durable – Being made of high quality leather means that this halter will last a long time, and will only get softer and more supple as the years go on. Leather needs maintenance – Any leather will start to get dry and brittle if it gets wet consistently and is not kept well oiled. Just give this halter a bit of love now and again and it will reward you. A well made, long lasting halter that does what it’s supposed to and will last for years. What more could you ask? It’s a bit pricier than some others, but you’re paying for the quality so it’s an investment. This is a multi-material halter, with webbing below the brow strap and leather above. Having soft, supple leather around the poll and the ears means that this halter is designed to be soft on your horse’s more sensitive areas. 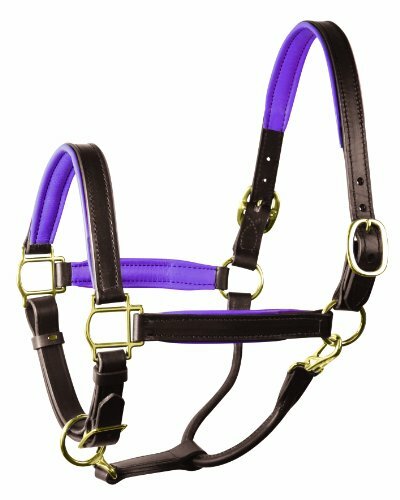 Strong at stress points – This halter has box stitching around areas that experience the most pull and are more susceptible to damage. This means you shouldn’t experience and fraying or tearing and means the halter should last a long time. Rolled throat for comfort – Having rolled edges to the halter instead of flat edges that may dig in will add to your horse’s comfort and means that he will happily wear his halter without digging or pinching. Throat snap as well as buckles – You can choose whether to put this headcollar on over the ears or buckle up by the side of the face, depending on how he is happiest being caught. Breakaway crown for safety – As we all know, horses can panic easily. Having a headcollar that breaks under the strain is infinitely preferable to having one that can get them into more difficulty. 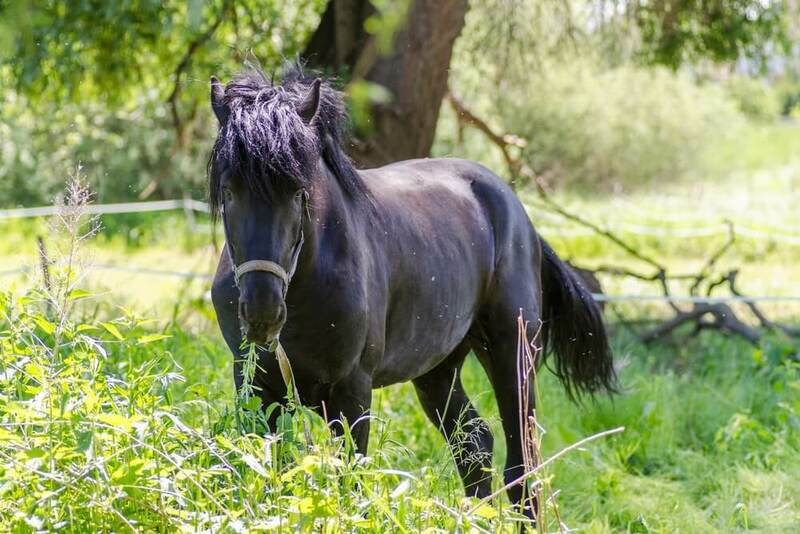 Sizes run large – If you have a smaller horse or pony, it would be wise to order a smaller size than you are used to avoid disappointment and having to send it back and get a replacement. A good halter for the horse that has the potential to be spooky, this one will break if they are in distress, avoiding potential injury. It’s also a good, functional attractive halter, so don’t be put off if you have a quiet horse who isn’t likely to break it! A beautiful classy halter, with the white stitching that can really make a leather headcollar stand out from the crowd. It has the throat snap or the over-the-head option, making it versatile. Adjustable noseband for easy fitting – If you have a cob sized horse with a pony sized nose, you may be frustrated with halters that hang off the nose. This one has adjustments that can make it the perfect fit. Rust proof hardware – Wherever you live, there is the chance that you, your horse and their halter will get caught in a downpour at some point. Having brass buckles that won’t rust is one less headache for you when finding the best horse halter! Reinforced stitching at bend points – You want a halter that will stand up to the strain of everyday use, and this one will do just that. Having that bit of extra support in the places it experiences most wear is invaluable. Reasonable price – Cost is always something to consider; let’s face it, horseriding is an expensive hobby! This is an inexpensive halter that will deliver the goods. Only comes in one colour – If you are looking for matchy sets for your riding gear then best to look elsewhere, as this one is only available in its stylish leather effect. This is a lovely leather halter which is versatile and good for any activity, whether that is showing in hand or simply collecting your best friend from the field. 1. What are the purposes of a horse halter? A good halter is essential equipment for any horse owner. A halter is needed to control your horse during training and day-to-day activities. Personalized halters can be helpful in identifying your horse if he becomes lost separated from you during an emergency. 2. Is a leather halter best? Leather halters can be costly, but they are definitely durable and can even be handed down from one horse to another when well-cared-for. 3. 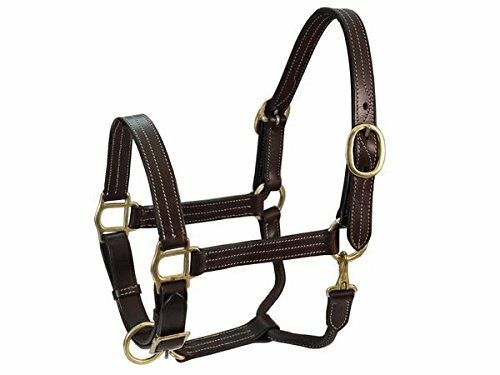 How do you take care of a leather halter? Good leather can last a lifetime and more if you keep it cleaned and conditioned. Set up a regular routine for cleaning and lubricating all your leather tack, including your halter. Don’t allow leather to become dry and cracked as there is no way to recover its strength and resiliency when this happens. 4. What types of leather halters are available? Padded leather: The padding comes in a wide variety of colors to match with blankets and other aspects of your gear. 5. Are there different kinds of halters for different kinds of horses? You can get good leather halters specially sized for ponies, cobs, full-sized and over-sized horses. 6. How important is sizing? Correct sizing is absolutely essential. A poorly fitted halter looks bad, limits the amount of control you have and can lead to injuries for both you and your horse. 7. How do you determine the right size halter for your horse? Begin by choosing the right size and style of halter for your type of horse. Look for a halter that has adjustment options on the noseband and crownpiece. Make adjustments carefully to be sure that the crownpiece sits behind the horse’s ears securely and comfortably. The cheekpieces run along the horse’s cheekbones and connect with the noseband. Adjusted correctly, the noseband should fall about halfway between the horse’s eyes and nostrils. You should be able to slip two or three fingers under the noseband easily. The throatlatch is supposed to fall under the horse’s upper jaw where the head joins the neck. You should be able to slide your hand under the throatlatch and take hold of it comfortably. You want it to be fitted enough to keep the halter from slipping over the horse’s head but not so big that a hoof could get caught under it. 8. How can you find the right halter for your horse? Begin by knowing how your horse is classified. Is he a pony, a cob, a standard horse or draft horse? Note that donkeys and mules may have larger heads than ponies and horses of the same body size. If you are looking for a halter online, check the website to determine what measurements you need to take to classify your equine and search for the right size halter. When searching online, use provided filters to narrow your search according to halter type, size and desired color. 9. What is a grooming halter? This type of halter has only a headstall and removable noseband. These features make it easier to groom your horse’s face and head, but this type of halter should only be used for grooming because it does not provide much control. 10. What are the benefits of nylon halters? These halters are colorful, affordable, easy to clean and practically indestructible. They come in to suit all sorts of equines from minis to draft horses. 11. How do you clean a nylon halter? Toss it in the washing machine with a couple of old towels. Wash in warm or hot water with a hypoallergenic laundry solution. Hang to dry. 12. Should you have both a nylon halter and a leather halter? Keeping a nylon halter for everyday use and a good leather halter for showing is a good strategy. If you have multiple horses, you may want to keep a collection of nylon halters handy just in case you need them. It’s always good to have a backup halter in case your leather halter breaks. 13. Are there any downsides to nylon halters? Their indestructibility can be a downside. In the case of an emergency, they will not break away (unless specially designed to do so). If, for some reason, you need to cut through a nylon halter to free a horse from a dangerous situation, you’re likely to have a very hard time doing so. 14. Are nylon halters safe? As long as the halter is well-fitted and your horse is not left unsupervised, they are safe. If a horse gets a hoof stuck in a nylon halter or gets caught on a fence, he will remain stuck until you come to help him. That’s why you should never use a standard nylon halter for trailering or turnout. Instead, use a breakaway halter. 15. What is a breakaway halter? This type of halter may be made of nylon or leather or a combination of the two. Connections holding the crownpiece and cheekpieces together may be snaps or Velcro, which can come apart easily in case of an emergency. This type of halter is not a good choice for working with a challenging horse, but for a well-behaved horse, it’s a good choice for turnout or trailering. 16. Why are rope halters so popular? Rope halters used to be associated with cowboys and western riding, but today riders of all disciplines like them. Part of the reason for this is that they have a reputation for being gentle but effective; however, this is not entirely true. The knots on rope halters apply pressure to sensitive points on a horse’s head. In the wrong hands, this type of halter can be quite painful. 17. How can rope halters be helpful? Many riders and trainers feel that the lack of hardware on a rope halter allows for more direct contact so that more subtle cues can be developed. The slim silhouette of a rope halter also makes it an ideal choice to be worn over a bridle during trail rides. It can also be used under a breakaway halter during trailering. When you do this, if your horse has a problem in the trailer and the breakaway halter comes off, you will not open the trailer door to find a horse with no halter and no way of moving him from trailer to destination. 18. Can a rope halter hurt a horse? Yes, as mentioned, knots are placed in sensitive areas to signal the horse during training. Multiple knots, and especially knots over the nose, can be very painful. If you do not have experience working with a rope halter, you should work with a trainer to learn how to use the tool safely and effectively. 19. How do rope halters compare with other types of halters? These halters are made of thinner material than nylon or leather halters. This means that any pressure exerted is applied to a small, narrow area rather than being evenly distributed through a wide strap. This means that a great deal of potentially damaging pressure can be applied. 20. Can rope halters be used for turnout or tying out your horse? A quiet horse can be tied for short, supervised periods with a rope halter. If an emergency does occur, cutting through a thin rope halter is easier than cutting through a nylon halter. These halters are not appropriate for turnout. 21. Do rope halters come in different sizes? Most rope halters come in one-size-fits-all. You are expected to make adjustments for perfect fit. Check to be sure that the noseband isn’t too loose. There is a knot at the chin that can be adjusted for a more secure fit. The throatlatch of a rope halter is tied rather than buckled. Take care not to tie it too tightly. Remember that you should be able to slip your hand between the throatlatch and the horse’s throat. Finding the best horse halter is like finding gold in your cornflakes – unexpected but wonderful! A halter is one of the most basic but also the most essential piece of riding equipment; without a halter how will you catch your horse and bring him in from the field, or lead him out of the stable? If you are looking for a beautiful, colourful leather halter then opt for the Perri’s Horse Soft Padded Leather Halter. If you have a horse that tends towards the dramatic and you need a halter that will snap if he gets himself into difficulty the Weaver Leather Breakaway Original Adjustable Chin Throat Snap Halter is for you, and for those looking for good solid quality, try the Derby Originals English Opulence Series – Coventry – Triple Stitch Adjustable Leather Halter. I always like to have one or two that give me the most points of contact with my horse. I am nervous that he is going to wriggle out of the halter and then I am off to the races trying to chase him down.